But what if you could be in a brainstorming session with hundreds of your potential customers, and 20 of the world’s best marketing minds? 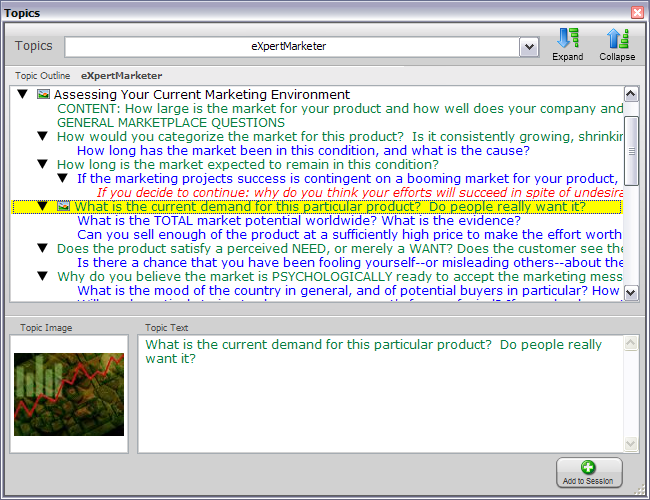 That’s what the Expert Marketer Module brings to the table. Start your personal Brainstorming Session by opening the Expert Marketer Module – an expert selection of hundreds of marketing questions and prompts – or just type a relevant word or phrase into the IdeaBrowser, to inspire fresh ideas that will make your product stand out. What you get back is an expert outline that will show you how to market a great product, create new positioning, branding and product definitions, all appearing to come from some amazing marketing experts – because they do!